Affenpinscher dog breed falls in the "Toy Group" of dog breed classification. 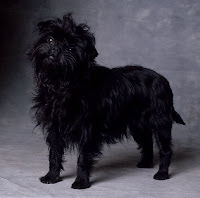 The Affenpinscher dog breed was bred in Germany in the 16th century. Affenpinscher are commonly referred to as the "monkey dog" due to their appearance which is similar to a monkey and their jovial attitude. Their strong character and sporting instinct makes the Affenpinscher useful in killing rats and mice. The Affenpinscher in todays world is kept as a companion dog.